Thanks to Quiet Connections for sharing their experience of the Emergency First Aid at Work course we ran for their volunteers and Quiet Community, who all feel socially anxious and uncomfortable in performance and assessment situations. 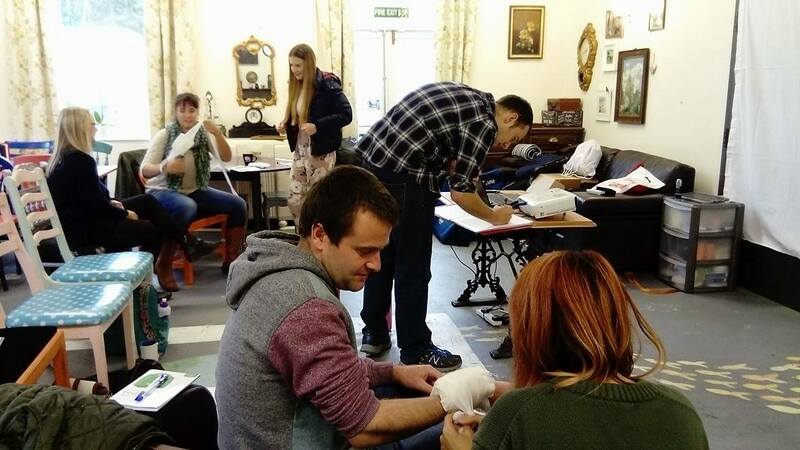 Who would have thought first aid training could actually be fun? That’s certainly not how I remember it being. I found it to be a hugely anxious experience when I was in my old job. There was no escaping the centre of attention and I felt like I was under the microscope as I awkwardly practised my first aid skills in front of large groups of people. I dreaded those training days. Turns out, that’s not how it has to be. Nine people from our Quiet Community joined us at Cafe Chaos for an Emergency First Aid at Work course. Why a Sunday? So that people who work 9-5 can attend too. We’re thoughtful like that. There were a lot of people who had wanted to do their first aid training but hadn’t felt comfortable doing it elsewhere so I was excited to be able to offer this opportunity to our Quiet Community and keen to get the rest of Team Quiet first aid trained. It was a good comfort zone stretch for many of us! Jason from Absolute First Aid made sure that it was run a little differently to the first aid training I’d previously had, not least with some brilliant real-life stories of first aid being put into practise and a good dose of humour. This time, we worked in threes with one of Quiet Connections’ facilitators in each group to support people who might feel less confident speaking up in the group right now (we’re all at different stages in our journeys after all). For the practical assessments, our groups went to three different areas of the room so we didn’t feel we were being watched. We had some time to practise CPR and help each other with our technique before Jason came to each group to quietly observe and ask us questions to check our knowledge. These small groups worked so well – it meant that everyone felt ok contributing something, guiding each other and receiving feedback and suggestions. And when Jason came to us, it certainly didn’t feel like we had someone looking over our shoulder and judging us harshly. He was patient, answered our questions fully, and corrected our techniques when needed. His calming, non-judgemental presence was quite a hit according to the feedback forms. Hearing kind reassurance and having time to think makes such a difference, doesn’t it? There were lots of laughs too! Imagine practising abdominal thrusts on each other (using an ActFast Choking Vest; no one actually choked on the biscuits) and being so careful to avoid hurting each other that it takes more than ten attempts to expel the ‘green bean pellet’! (Yes, we are a really nice bunch.) It seems all of these uncomfortable experiences – practising resuscitation; putting someone in the recovery position; bandaging an arm – have a little humour to them once you feel safe amongst a small number of people who truly understand you. It’s the first time I’ve really left any first aid training thinking, “yeah, I actually could help someone in an emergency”. Previously I’ve completed the day and left with absolutely no confidence in my life-saving abilities at all. This time, 8 out of 9 participants felt it was highly likely they’d use their skills if they came across an emergency situation. Not bad for a group of people who often feel low in confidence huh?